Learn more about Maple Syrup! 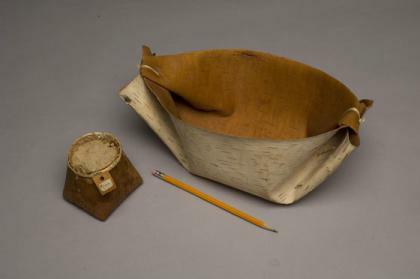 Folded and tied from a single piece of bark, buckets like this are seamless and leak-proof, making them excellent containers for collecting sap. The makuk stores sugar after it has been processed from the sap. Popular tourist items, this one originally sold for $1.00 in 1955. For generations, the Ojibwe Indians in Minnesota have tapped maple trees for sap during the spring. Traditionally, they tapped a wood spile or spigot through the tree’s bark into the living tissue, or phloem. Sugary sap drained out of the tree and collected in a birch bark bucket. Boiling and evaporating concentrates the watery sap into thick maple syrup. Further processing creates maple sugar. Dried sugar was easier to store and carry than maple syrup, especially when packed into birch bark containers called makuks. American Indian people use maple products to season fruits, vegetables, cereals, meat and fish.